Area Rugs - College Dorm Decorating Ideas - Dorm Room Decor - Fraternity Room Decorating - Sorority Decorating Ideas. 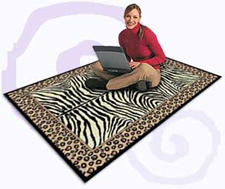 DormRugs.com is a Dallas based rug importer/distributor. We have access to many products lines at very great prices. Unlike a retail store with massive overhead, we are able to pass these savings on directly to the consumer and offer pricing comparable to wholesale on many of our lines. We are confident you will be very happy with the products that we carry as well as the price.